Raphael Saadiq introduces his new sound at the Regency Ballroom. 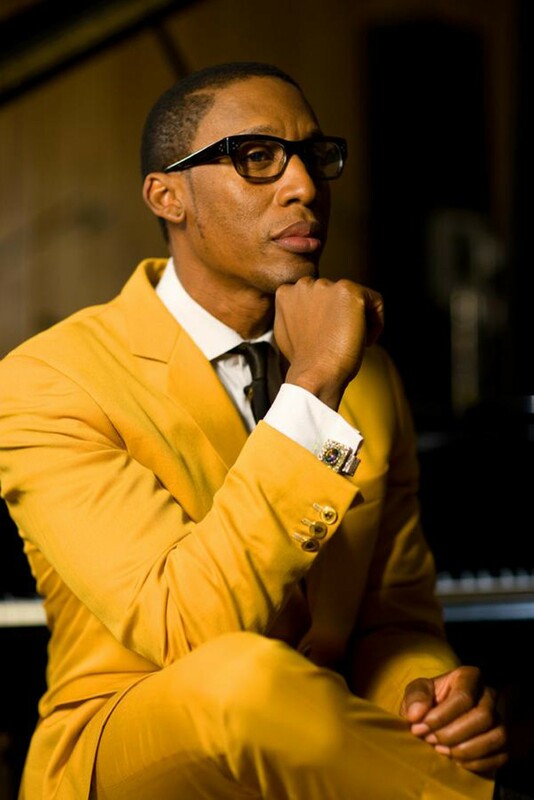 Three tunes into his high-energy, two-hour-and-ten-minute performance Friday night at The Regency Ballroom, as his seven-piece band laid down a hard-churning old-school Motown shuffle, Raphael Saadiq stumbled over the opening lines of his song "Love That Girl." "I forgot the words," he confessed to the close-to-capacity audience of some 2,000. "That's 'cause I've had so many hits. And they play it on TV too much." The Oakland-born, Los Angeles-based singer, songwriter, producer, and multi-instrumentalist tossed his microphone to backup vocalist B.J. Kemp to sing the first chorus, but remembered the lyrics in time to take the helm for the second. The reed-thin Saadiq, garbed in a back suit and gray sweater, skipped back and forth across the stage as he sang in high, silky tenor tones over Calvin Turner's loping James Jamerson-inspired bass lines and the Jack Ashford-like jangle of backup singer Erika Jerry's tambourine. Strapping on a guitar from time to time, though leaving the solo space to guitarists Rob Bacon and Jon Lammi, the 44-year-old musician focused on numbers from his five solo albums during the first hour and a half of the show. Much of the material was drawn from The Way I See It, his masterful 2008 homage to the Motown sound of the Sixties. It featured original songs that were way too retro to fit into the new-soul niche he had helped invent through his work with Tony! Toni! Toné! and his productions for Erykah Badu, D'Angelo, Kelis, Jill Scott, Angie Stone, and Joss Stone, among others. Saadiq also previewed a few tunes from his forthcoming Stone Rollin'. Due out May 10, the disc is his most radical stylistic departure to date. Besides Motown, Sly Stone, and gospel quartet influences, the CD brings elements of Chuck Berry, Chicago blues, and garage rock into the mix. Judging from recent bookings at South by Southwest and Coachella and the terrific job he and his band did backing Mick Jagger at the Grammy Awards two months ago, he seems to have his career sights on achieving the crossover appeal that has long eluded him. He even dropped his horn section, paring the band down to three guitars (including his own), keyboards, bass, drums, and two harmony vocalists for a more rock-oriented sound. The bespectacled singer is all set to rock and roll, which is exactly what he did with "Heart Attack," the lead track of Stone Rollin' and the second song at the Regency show. Saadiq's knees wiggled as he picked his guitar and effusively wailed over a fiercely throbbing groove anchored by Lemar Carter's four-on-the-floor drum beat and spiced with burbling background vocals borrowed from Sly's "Dance to the Music." He rocked out even harder on "Radio," a frantic twelve-bar blues that's unlikely to find favor with R&B stations. I'm taking the chances of a fool, Saadiq cried out at the end of "Radio." He's no fool, but he is taking chances with his new musical direction. Many fans and critics gave him flack for The Way I See It, and he is likely to get even more when Stone Rollin' is released. Throughout the history of African American music, most artists have run away from the past, abandoning old styles while searching for something new and innovative. During the bebop era, for instance, musicians who embraced earlier New Orleans jazz were derided as "moldy figs." Wynton Marsalis has suffered similar barbs for having incorporated the pre-bop influences of Duke Ellington and Jelly Roll Morton into his original post-bop music. Likewise, Saadiq has dared to dig into the roots of rock and soul to build stepping stones into the future. Three quarters of the way into the show, Saadiq switched gears. As the band played a sweet-soul groove, he reminisced about how he and Rob Bacon initially hit it off due to their mutual admiration for the Isley Brothers. After Bacon played an extended Ernie Isley-inspired solo that concluded with the guitar behind his head, Saadiq came in crooning "(Lay Your Head on My) Pillow," the 1994 Tony! Toni! Toné! hit. Many in the adoring audience sang along without prompting, as they did during the other TTT favorites, including "It Never Rains (In Southern California)," "Anniversary," "The Blues," and "Feels Good," with which he wound up the long concert. The fans seemed to enjoy Saadiq's post-TTT numbers, even rockers from Stone Rollin', but when he went back to the soul songs that first made him famous, they melted.